Saudi Arabia Must Be A Beautiful Ethnic Matrix! Why are all the kids on Saudi Arabia Little League Baseball Team blond? Are there blond kids in Saudi Arabia? I find it absolutely adorable! saudis are not represented by one single race of people.. There are blacks, browns, blondes, orientals,, all races represented in the saudi nationalities..
(Mintee must be a teacher in that part of Saudi Arabia known as Narnia where unicorns run freely on the streets and some of his other students are Care Bears). 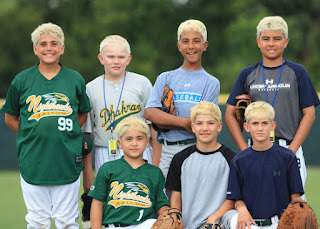 Arabian-American (but mostly American) Little League team.